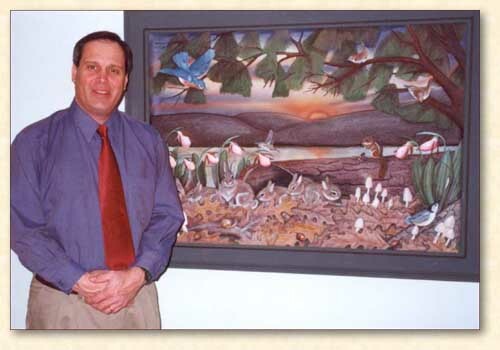 Allen Weidhaas with a private commission "Sunrise at the Lake," a relief wood carving created for the main entrance foyer of a custom built home on Smith Mountain Lake, Virginia. The fictitious piece includes all of the home owners' favorite neighborhood animals. Ironically, all of the same animals and flowers held a special meaning to the artist as well. 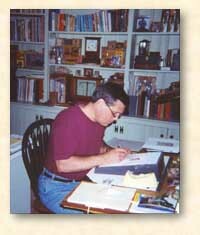 Allen Weidhaas was born and raised in western Massachusetts. A childhood of summers growing up on a lake, with camping, shooting, fishing, and boating, led to a life-long affliction of admiration and closeness to the outdoors, nature, and wildlife. His father and older brother enjoyed this life style and it was natural for Allen to tag along. And, there is an obvious influence of the gentler side of nature through the teachings and observations of his mother. Allen still recalls the first pink lady's slipper and white-lipped forest snail his mother pointed out to him at an early age, and how she seemed to attach such great importance to the small wonders of nature. To this day, his upbringing remains a strong influence in his life. By the age of sixteen, Allen had found an intense desire to express himself in some form of visual art. Most of his endeavors were two dimensional works, but a trip to Arizona in 1971 changed Allen forever. On this trip he was able to visit the studio of a well known western artist--a painter who also did sculpture. It was the sculpture in 3-dimensions that really caught his eye. Allen was able to visit the foundry this artist used also, and it was this experience that captivated him. "The whole process of bronze sculpture was so intriguing. So hands on! It was a medium through which you could pour your heart out through your hands, pushing and moving that clay around." It was this medium on which Allen wanted to someday concentrate. When Allen was 18 years old, his family relocated to rural southwestern Virginia. That fall, he struck out for Billings, Montana, and the Art Department of Rocky Mt. College. He later transferred to the Art Institute of Ft. Lauderdale and in 1974 graduated as a graphic designer with illustration being his major strongpoint. He worked for several years in the advertising industry. Throughout this period he continuously concentrated on 3-dimensional work on his own time. In 1976, Allen embarked on a three year period of full time self-study with sculpture. He explored different mediums, materials, and techniques. This culminated in his first sculptures cast in bronze. It was during this time, too, that he discovered a fascination for working directly in wood. In 1978, wildlife finally resurfaced and developed as his main subject of interest, and he began to find a steady audience of collectors for his one-of-a-kind wood carvings. A desire to create all forms of flora and fauna, including birds, fish, undersea life, and even insects--in general, anything and everything in the natural world--became his main focus. He admits that at times he carries this to an extreme by including the usually overlooked tiny details of a setting in his compositions. He has found that the majority of his collectors enjoy these additional details in the little vignettes. In some of his works, Allen essentially recreates the whole eco-system. To this day, he continues to gain self-satisfaction in carving, where the artist is in such great control over the end result. 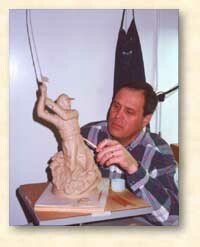 With bronze sculpture, most artists have to rely on a commercial foundry service to be involved. Through the mold making process, the type of tools required to work with the bronze, and the nature of the material itself, a constant vigilance must be waged so as to keep the loss of detail and esthetic feeling of the scupture to a minimum. Applying the patina to the finished bronze is an art unto itself, and requires separate study. But in Allen's opinion, the benefits of limited edition lost wax bronze sculpture far outweigh any of it's drawbacks. The ability to produce more than one sculpture of the subject, which is lost in most other alternatives, adds a considerable advantage to the artist. And too, bronze is an old world "high art" medium used for centuries to freeze for all time the creative visions of the artist. It ranks right there next to carved marble. In 1996, Allen returned to working in bronze, continuing the tradition of quality for which he had become known through his wood carvings. The bronzes afford him the ability to now reach a greater number of collectors. There is a new emphasis for him on bronze sculpture. 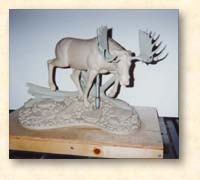 Most of his bronzes are cast in Montana by several different foundries. Due to the nature of the foundry process, he travels there when necessary. He continues to do only selective one-of-a-kind wood carving commissions. The works of artist-sculptors Frederick Remington, Daniel Chester French, and Augustus Saint-Gaudens have all influenced and inspired Allen. These artists are another testament to ageless bronze. He admits further inspiration from the old master painters of sporting arts such as Weiler, Pleissner, Goodwin, Stick, Frost, Ripley, and Rungius. 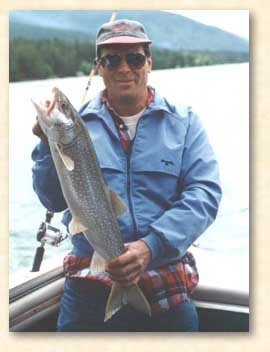 "They bring back treasured golden memories to an outdoorsman's sporting life." 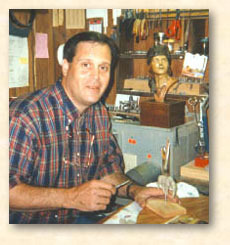 Allen has won numerous prestigious awards over the years for both his wood carvings and bronze sculpture. In addition to wildlife and nature, his works include hunting and fishing sporting figures, hunting and fishing still life, figurative, and monumental pieces. He will stray occasionally from wildlife and sporting art. In April, 2000, he was honored to be commissioned to do a life size-and-a-half monument of the famous Confederate Civil War general J.E.B.Stuart to be portrayed when he was a youngster growing up in Ararat, Virginia, his birthplace. The monument was commissioned by the J.E.B. Stuart Birthplace Preservation Trust, Inc. Installation will be on the birthplace property. The majority of Allen's professional career has been spent in the southeastern United States (Virginia, Maryland, North Carolina, and South Carolina), but he maintains a gallery presence in the northwest, as well. National advertising and involvment in national wildlife art shows afford him the opportunity to draw on an audience across the country. His works have been collected by institutions, corporations, and private art patrons across the United States. His work has been purchased by The Virginia Historical Society and is on permanent exhibit at The Virginia History Museum, Richmond, Virginia. The artist has shown his work by invitation at the Virginia Marine Science Museum, Virginia Beach, Virginia. 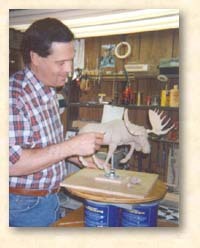 He has been called upon to judge in the decorative miniature class in waterfowl and bird carving. Allen was honored with a nomination for the Virginia Governor's "Awards for the Arts" in 2000. He has always supported wildlife conservation. Allen maintains a temporary summer studio in Montana, and a permanent winter studio in his adopted hometown of Stuart, Virginia. The artist on a fishing trip. Copyright � 1999-2007 by Allen F. Weidhaas, Sculptor All rights reserved. For review only. No rights granted.